After a grueling bipartisan battle, Brett Kavanaugh has been confirmed to the Supreme Court by the Senate. The final vote, which was repeatedly interrupted by protestors, was 50-48. Kavanaugh's confirmation marks a huge ideological change for the Supreme Court — he is replacing justice Anthony Kennedy, who was a much needed swing vote on issues ranging from LGBTQ rights to abortion. His appointment coming even after the courageous testimony of Dr. Christine Blasey Ford, who accused Kavanaugh of assaulting her when the two were teenagers, further hammers home how irreparably damaged the country is when it comes to sexual assault. Senate Minority Leader Chuck Schumer called Kavanaugh's confirmation "one of the saddest moments in the history of the Senate," and said, "this chapter will be a flashing red warning light of what to avoid." He added that Republicans "conducted one of the least transparent, least fair, most biased processes in Senate history, slanting the table from the very beginning to produce their desired result." 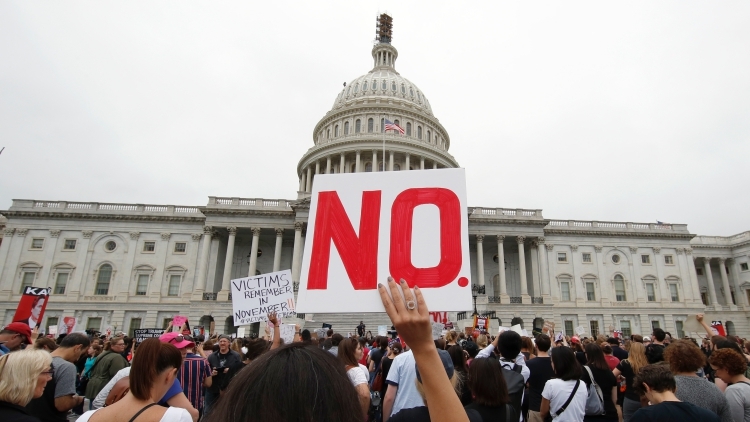 "I do not consent, where's my representation," one protestor yelled as senators prepared to vote, reported CNN. Kavanaugh's confirmation is sure to have prolonged repercussions on November's midterm elections — register to vote here.